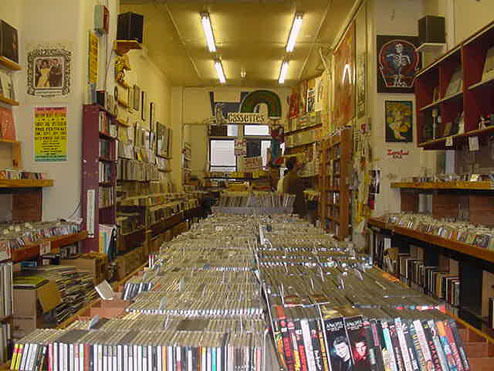 Local Rhythms – Whither Record Stores? Where’s the government bailout for the music industry? If taxpayers should rescue Ford and GM before they run out of gas, what about Warner Brothers? Heck, what about Music Matters, the latest local record store to close shop? For years, the West Lebanon business stood out from the big box operations, hosting live shows from local bands and stocking deep catalog items. Last week, owner Rob Nahabedian gave up the ghost. According to the San Diego Union-Tribune, more than 3,000 record stores have closed since 2002, while more than 5,500 record company employees were laid off between 2000 and the middle of last year. These days, most CDs are bought on impulse while traversing between the light bulbs and the laundry soap. Worse than that, these transactions are carried out with a complete disregard for the old way of commerce. Many artists are making an end run around record companies and dealing directly with the big boxes. Journey, the Eagles and AC/DC all made exclusive deals with Wal-Mart, while the Beatles, Usher, Elton John and the Police each have Best Buy-only releases. Once upon a time I used to seek out ears of authority like Jack Black’s clerk character in the movie “High Fidelity.” I devoured magazine stories about Atlantic Records founder Ahmet Ertegun. Do they matter today? When Warner Music Group CEO Edgar Bronfman Jr. recently spoke of his label as an “editorial voice” that molds raw talent into something more refined, I was incredulous. These days, the big labels buy finished product from successful indie bands, and distribute it. They are to original music what the Drudge Report is to news. Earlier this year, the German label Dependent Records went out of business rather than continue trying to fight piracy. Fans can steal music as long as labels produce it, he said, but then what? False economies are wrong. No amount of taxpayer money will make Detroit build better cars, for example. But for music, there must be some middle ground. Thursday: Gregory Douglass, Higher Ground – Many of this young singer-songwriter’s tunes fall into the “long dark night of the soul” category. His upcoming CD “Battler” deals with father/son relationships, life’s day-to-day struggles, love and other murky topics. Over the course of 8 albums, Douglass has relied on his fan base to finance his work, with innovative offers reminiscent of the Obama campaign fundraising machine. Friday: Rhonda Vincent & Jerry Douglas, Lebanon Opera House – The first night of this weekend’s bluegrass festival is the best, with Vincent, who sings as well as she fiddles, topping the bill. But the real draw is Douglas, who owns his instrument in a way that rivals few other players. For my money, he’s not just the best dobro player in the world, he’s the only one. Douglas’s work with Alison Krauss is legendary. His solo stuff is sublime. Saturday: Belly Dancing Recital, Woodstock Town Hall Theatre – Here’s a fun change of pace – South Royalton dancer Gina Caposella has taught in the area for 18 years; this is the 5th annual public performance by her students, which includes special guest appearances. The night features classic Egyptian, Hagallah, Khaleegy, Melaya Leff, swords, live drumming, circus performance and more. It frequently sells out, so call ahead for tickets. Sunday: Nick Alexander Benefit, Salt hill Pub – If it’s Sunday and there’s music at Salt hill, that usually means another fundraiser. This time it’s for an area ski jumper with Olympic dreams. The benefit performance features Wise Rockobili and his bassist from Kaila, the fascinating world music band he’s fronted for some time. Money raised from the show will help Nick compete in few European events this winter. Tuesday: Billy Rosen & David Westphalen, Tip Top Café – Though Elixir is closed, weekly jazz in White River Junction continues at this interesting eatery. Rosen is a terrific improvisational guitarist, while Westphalen can often be seen fronting Swing Machine. Together, they lay down a wonderful groove. I’m a big fan of the WRJ renaissance, and Tip Top is one big reason why. Wednesday: Trans-Siberian Orchestra, Verizon Wireless Arena – If you’ve never seen this 25-member extravaganza, you owe it to yourself (and your kids if you have them) to check it out. I’m not a big fan of arena shows, but there’s no place more appropriate for TSO’s combo of lasers, smoke, bombs and majestic orchestral rock. A word of warning – at this point, TicketMaster is only scalping tickets (at more than double face value) for the evening show- ain’t monopoly grand? There’s a matinee at 4:00 PM, as well as several other upcoming New England shows, however.